The whole Dropbox idea has been a very successful story so far. And now they’re apparently looking to get photographers to use their service. A recently released experimental version â€“ read “you should backup your files or otherwise it might eat them along with your firstborn” â€“ now comes with an integrated tool that detects a camera or memory card once you plug it into your USB port. There’s also an experimental Android version available (APK here) that uploads files automatically in the background using 3G or Wi-Fi. 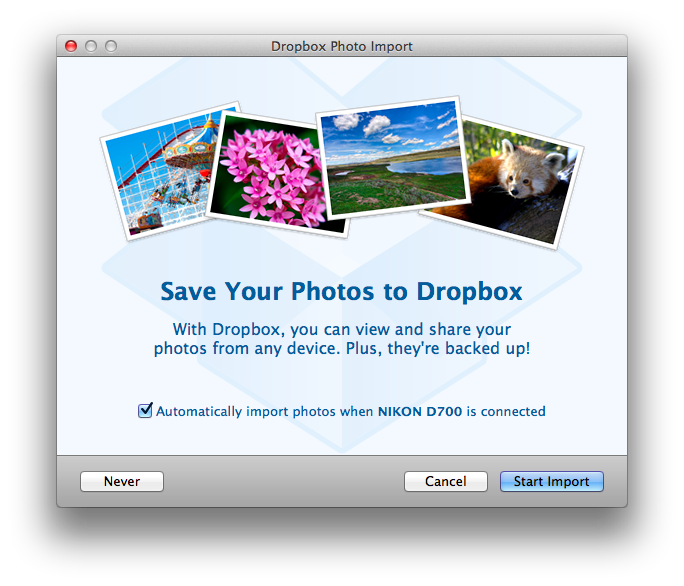 After detecting a camera/card you are presented with a simple screen (see above), asking whether or not you’d like to import the photos and videos to your Dropbox. All uploaded files then show up in a new “Camera Uploads” folder and will be saved in the cloud. Dropbox Photo Import also comes with a little gem: For the first upload you get 500 MByte, afterwards for every 500 MByte uploaded you’ll also receive 500 MByte of space. In total you can reach up to 5 GByte this way. For Android devices, it’s best to use “Connect as Disk Drive”. HTC Sync will not work. If importing from your iPhone on Mac gives an import error, try hard resetting it–hold down the power and the home button for 5 seconds. This will reboot the phone; it shouldn’t change your settings or delete data. On Windows 7, newer devices that rely on Device Stage (in the Control Panel) will not show Dropbox as an import option until you select “Change Program” for the default. The Galaxy Nexus takes a lot of time to connect on OS X because it likes to pretend that every image on the device is a photograph. We now estimate how long it’s going to take and show you that in the progress bar but it’s usually in the order of minutes. We’re working to see if this can be improved.